Marriott Suites Deerfield is located just across the street from the Deerfield Golf Club. 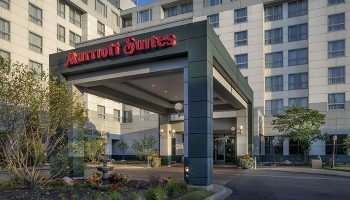 When you’re looking for hotels in the Chicago area, the Chicago Marriott Suites Deerfield offers a convenient location and spacious accommodations. 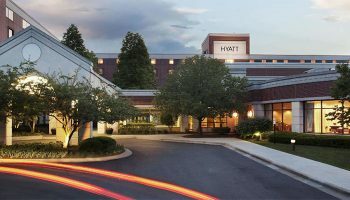 Set on Chicago’s North Shore just off the Tri-State Tollway (I-294), this all-suite hotel is close to O’Hare International Airport (ORD), downtown Chicago and numerous local attractions including Six Flags Great America, Gurnee Mills and the Great Lakes Naval Training Center. In your well-appointed suite, you’ll enjoy a sitting room featuring a 32″ LCD HD flat screen TV featuring Plug-In Technology, wet bar, refrigerator, microwave, plus a luxurious bath. You can work out in the fitness center, with cardio and weight equipment and relax in the indoor or heated outdoor pool, whirlpool and sauna. With Transportation to the golf course available, the Marriott Suites Deerfield is a perfect choice. Show your room key for a FREE Rental set with a paid round of golf. Let our hotel in Deerfield become your favorite option when staying in Chicago’s North Shore area. 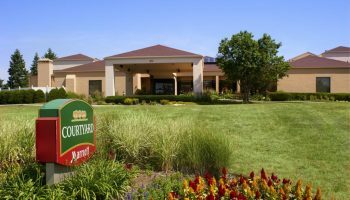 The Courtyard Chicago Deerfield hotel is close to many area businesses as well as popular Chicago area attractions including Six Flags Great America, Chicago Botanic Gardens, and Ravinia Festival. This hotel is also located only a short walk from the Chicago METRA Line, providing convenient access to downtown Chicago. Relax and get ready for the day in one of our spacious Deerfield guest rooms or suites. All rooms at Courtyard Chicago Deerfield Hotel feature wireless high-speed Internet access, premium pay movies and free in-room coffee. Begin your day at our Deerfield hotel by enjoying a reasonably priced hot buffet breakfast from the Courtyard Cafe, or grab a snack from The Market, offering 24-hour service with a variety of food and beverage choices. At Courtyard Deerfield, experience a complete, one-of-a-kind hotel – designed to meet all of your travel needs. Deerfield Courtyard is located about 2 miles southeast of Deerfield Golf Club near Bannockburn. Step into distinguished luxury at the newly renovated Hyatt Deerfield. Discover a refreshing suburban retreat from the moment you enter our sky-lit lobby atrium, with its contemporary design and soothing reflection pond. Every guestroom in our hotel is suite-sized, boasting separate sitting areas, sleeper sofas and 42″ flat screen televisions. Sleep upon a luxurious Grand Bed (TM) with fine linens and plush pillows and indulge in the premier amenities offered at our hotel, conveniently located just 20 minutes from O’Hare and 35 minutes from Downtown Chicago. Host an unforgettable holiday party, meeting or wedding reception in an elegant, updated venue. Situated just off I-94/294, and surrounded by shopping, Wheeling’s Restaurant Row, Six Flags Great America, and world-class golf courses, our hotel is the premier choice for discerning travelers.